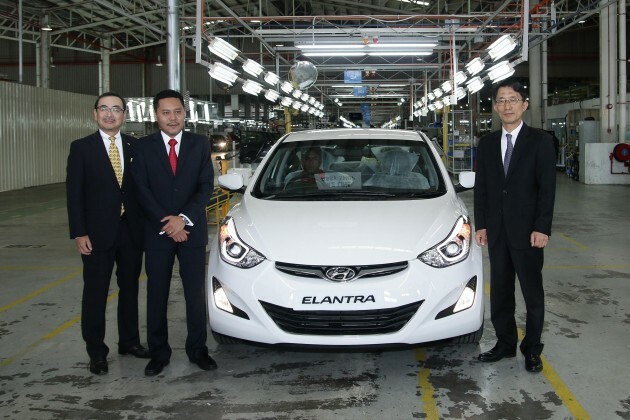 In a follow-up to the launch of the Malaysian-assembled facelifted Hyundai Elantra in Thailand, Inokom has announced that it has indeed been assembling the refreshed Korean sedan in its plant in Kulim, Kedah and exporting it to the Thai market. As we reported earlier, the move was made due to favourable tariff rates as a result of the ASEAN Free Trade Agreement (AFTA). 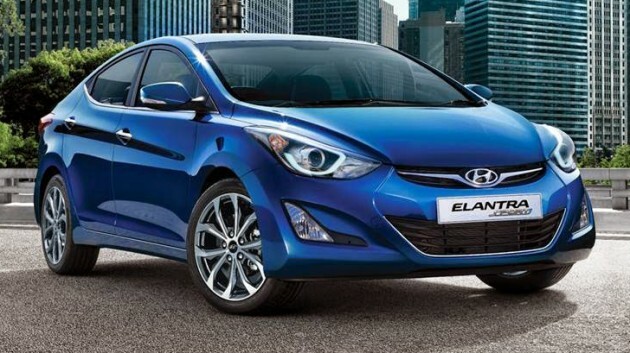 Around 1,000 units of the new Elantra are expected to be shipped to the Land of the Smiles in the first year. So far, the company has already exported 200 units since June, and will ship another 200 units early next month. The number of cars exported is expected to increase to meet an anticipated increase in market demand due to the significant price drop over the previous Korean-built model. How significant? Prices for the new Elantra start at 749,000 baht (RM74,800) for the base GL model, rising up to 819,000 baht (RM81,800) for the GLE and 898,000 baht (RM89,600) for the top-spec GLS Navi. This is in contrast to the outgoing model, which came in at between 899,000 baht (RM89,700) and 1,198 million baht (RM119,600). “Though this is our first collaboration with Inokom, we look forward to future collaborations and possibly, for the other Hyundai models as well,” said Hyundai Motor Thailand president Hideki Yanagisawa. Inokom’s managing director Rizal Jailan said that this collaboration may grant the company more export business avenues, particularly through the assembly of Hyundai models. Rizal also mentioned that Inokom was looking to establish a long-term working relationship with Hyundai Motor Thailand, as well as looking and evaluating other business opportunities in ASEAN. In addition, the company is hoping to further cement its support for the new National Automotive Policy (NAP) through the development of new vendors and the increase in participation of current local vendors. Now that we are already assembling the facelifted Hyundai Elantra for other markets, how long more until we can have the spoils for ourselves? Of course. Why you think in Thailand Altis is cheaper than here? Because bodoh Malaysians will pay for it. Thai people are clever, they will question and boycott! Thai say: TQ Inokom Hyundai selling 1.8 Elantra CBU Msia at 74k to 89k & most significant cheaper than origin manufacturer country 9x-11x k.
while msian pay more, high commitment cannot enjoy life, & suffering 9yrs loan. Malaysians have no shame. This is like Proton. Sell in rich Arab countries half the price. Every single Proton model is sold in Arab countries for half the price sold here. We Malaysians are subsidising rich Arabs to make them even richer. Proton make its own people, their own flesh and blood suffer with double the price. Government make its own people suffer. Like this Hyundai, Government make its own people suffer and sell it cheaper to Thailand. When are the kampung people going to wake up and see the truth and light? We poor Malaysians subsidise rich Arabs and give them cheap Made in Malaysia Protons for half the price! Berita baik ini adalah akibat ketekunan kerja pekerja pekerja MAI. Pekerja pekerja MAI berkerja kuat untuk menjadikan Inokom assembler yang paling handal di dunia ini. Saya ucapkan tahniah dengan pencapaian ini! u assemble the car here in Malaysia but export to other market first? Inokom Badged cars will have the same fate as KIA. assemble here but sell to others cheap even though include all the transportation costs and what not. if sell here cheap, say no make money. Look at it this way – this is 1st time building this car with Hyundai badge…so sell 1000 units to thai to ‘test water’ on quality lah! It will be ultra cold door car in Thailand. We got it… Toyota is the best in the world, kimchi cars worthless. pity malaysian. locally assembled but expensive than export model to thailand. not to mention we are always lack behind of everything! Kindly re paint your production floor before take a photo TQ, This photo might represent Malaysia. I’m so sorry to see that our people still doesn’t realize that 50% of high car prices now is attributed to the car makers (or assemblers) taking advantage (and profiteering) from the deep rooted notion that car price is high ONLY due to government taxes. Yes, government is partially to be blamed, but lowering taxes also result in the companies taking in more profit rather than just passing the benefits to the consumers. Inokom & Hyundai is the blatant evidence of such companies taking advantage of the CKD program. They are doing it, because they just can. More profit per car even though less car sold. Still same $$$ at the end of the day, with less work!